Markets are trying the upside since the start of a new lunar Green period last week, but so far the move seems to lack conviction. After several strong lunar Green periods ( see our Performance page, which is now easier to read), we could be in for a weak one. The coming week will make it more clear. As we mentioned last week, we could be forming a double top here, which wouldn’t bode well for the second half of the month. If the market fails to get above 1475 this week, then I would take some profits and/or buy some protection for my portfolio. 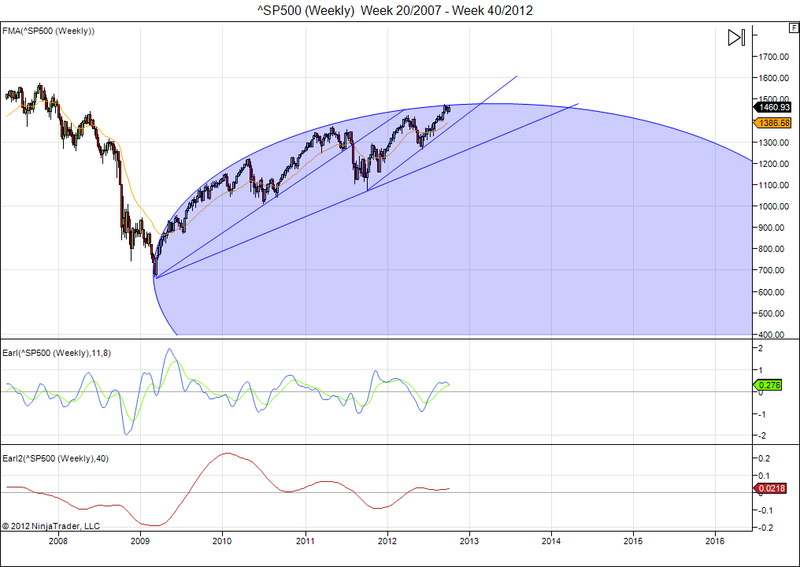 Since the 2009 lows, the market action in the S&P 500 index has been capped by a large ellipse, with multiple touches. As long as the market doesn’t break decisively out of this pattern, we have to consider it valid. This means that the 1470 level could continue to form major resistance for the next year or so. Meanwhile my Earl indicator (blue line) is just turning down, giving a sell signal. The slower Earl2 is barely holding above zero, also suggesting weakness. This means we probably need a downswing before we can try the upside again (likely in early 2013). This is a long term weekly chart. 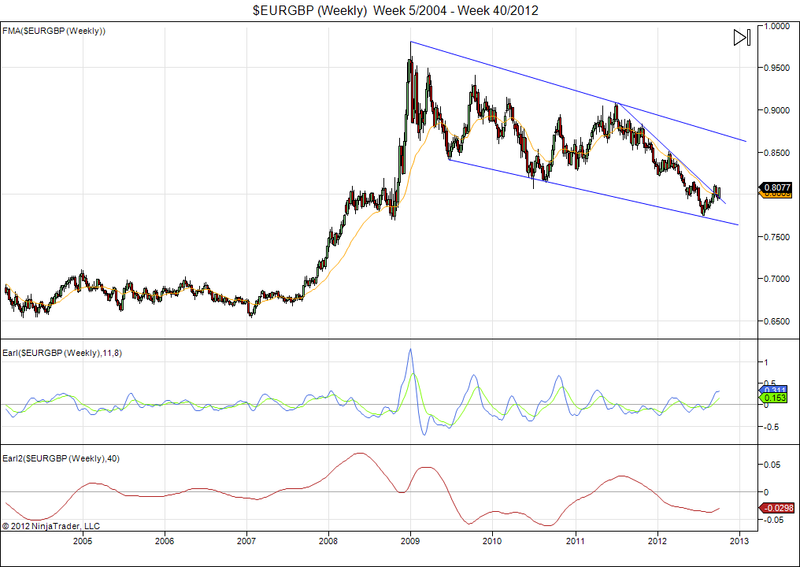 The Euro has been weakening against the Pound since early 2009. My slow Earl2 indicator has recently turned up from its oversold levels. This suggests that a bottom is in place or very near. This entry was posted on October 8, 2012 at 12:23 pm	and is filed under Market Commentary. You can follow any responses to this entry through the RSS 2.0 feed. You can leave a response, or trackback from your own site.